WILLEMSTAD - Gerrit Schotte has ordered to stop all talks with the Chinese State Company Guangdong Zhenrong Energy. 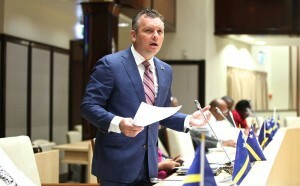 As the new leader of the majority in the Parliament of Curaçao, the MFK leader finds that these negotiations are not part of the current state of affairs. Outgoing Prime Minister Hensley Koeiman had sent a list earlier to Parliament with the current state of affairs of the government. Also for many other projects on the list, Schotte did not give the green light. Schotte believes for example that the renewal of the government website and a number of planned business trips are not pending cases.